A normal mirror transformed into a shabby chic fabric mirror. Peeps, let's have a look on her tutorial. cantek kan..?? i jatuh cinta tgk! terus tanam azam nak buat kat umah.. hehe! 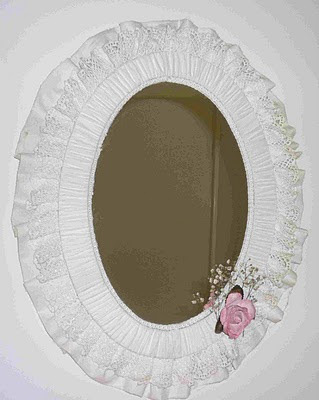 Thank you for putting my shabby chic fabric mirror on your blog ! here is my blog address you may find a few more posts that you may find suitable for your blog ! Thanks for stopping by. No worries, I'll definitely drop by and take a look. Cheers! i love Shabby Chic fabric they are simply gorgeous, thank you for hosting this wonderful giveaway.